Saul, still breathing murderous threats against the disciples of the Lord, went to the high priest and asked him for letters to the synagogues in Damascus, that, if he should find any men or women who belonged to the Way, he might bring them back to Jerusalem in chains. On his journey, as he was nearing Damascus, a light from the sky suddenly flashed around him. He fell to the ground and heard a voice saying to him, “Saul, Saul, why are you persecuting me?” He said, “Who are you, sir?” The reply came, “I am Jesus, whom you are persecuting. Now get up and go into the city and you will be told what you must do.” The men who were traveling with him stood speechless, for they heard the voice but could see no one. Saul got up from the ground, but when he opened his eyes he could see nothing; so they led him by the hand and brought him to Damascus. For three days he was unable to see, and he neither ate nor drank. There was a disciple in Damascus named Ananias, and the Lord said to him in a vision, Ananias.” He answered, “Here I am, Lord.” The Lord said to him, “Get up and go to the street called Straight and ask at the house of Judas for a man from Tarsus named Saul. He is there praying, and in a vision he has seen a man named Ananias come in and lay his hands on him, that he may regain his sight.” But Ananias replied, “Lord, I have heard from many sources about this man, what evil things he has done to your holy ones in Jerusalem. And here he has authority from the chief priests to imprison all who call upon your name.” But the Lord said to him, “Go, for this man is a chosen instrument of mine to carry my name before Gentiles, kings, and children of Israel, and I will show him what he will have to suffer for my name.” So Ananias went and entered the house; laying his hands on him, he said, “Saul, my brother, the Lord has sent me, Jesus who appeared to you on the way by which you came, that you may regain your sight and be filled with the Holy Spirit.” Immediately things like scales fell from his eyes and he regained his sight. He got up and was baptized, and when he had eaten, he recovered his strength. He stayed some days with the disciples in Damascus, and he began at once to proclaim Jesus in the synagogues, that he is the Son of God. All who heard him were astounded and said, “Is not this the man who in Jerusalem ravaged those who call upon this name, and came here expressly to take them back in chains to the chief priests?” But Saul grew all the stronger and confounded the Jews who lived in Damascus, proving that this is the Christ. Imagine the fear of Ananias as he approached Saul. What great faith he had in the Lord to fulfill his commands and approach a man who had murdered many Christians. 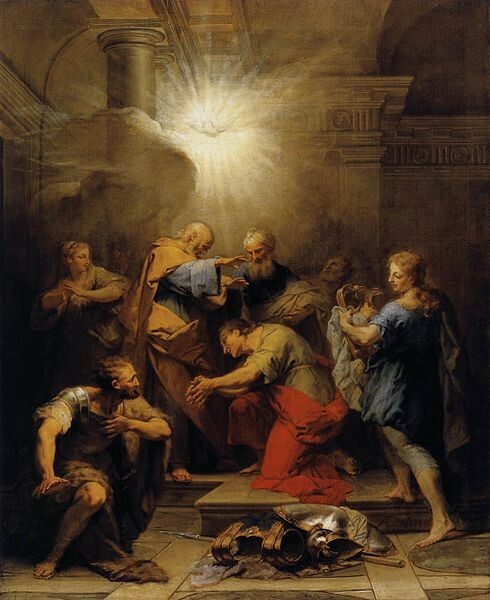 Had Ananias not done this, many gentiles may not have been shown the truth by St. Paul and the world as we know it could be a much different place. Who do you identify most with in this story? Who do you desire to be? Put yourself in Ananias’ shoes. How would you have responded to the Lord’s commands? What are things you can do to increase your faith so that you may be ready to trust the Lord in a potentially life and death situation at a moment’s notice? Pray for discernment to know what the Lord is calling you to do to increase your faith. Resolve to see a situation today with the eyes of Christ.